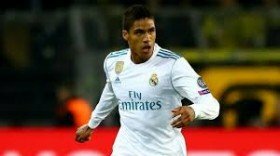 Real Madrid boss Zinedine Zidane has stressed that Raphael Varane remains indispensable to the Bernabeu giants despite the recent speculation linking him with Manchester United. The France international has been with the Madrid giants for nearly eight years and during this period, he has won two La Liga titles, one Copa del Rey and four Champions League crowns. Despite this, there has recently been the gossip that he could pursue a fresh challenge, but Zidane does not believe such a situation will arise with his compatriot capable of making progress at Los Blancos itself. "That feeling is positive, he knows what he has done here and it is normal that there are rumours that they want him, but I see him well here, he is the fourth captain here and his progression here is not over," he said via Marca. United have tracked the development of Varane since his time at former club Lens and he was strongly tipped to join them under the guidance of ex-boss Jose Mourinho. Even after the Portuguese's dismissal, they have continued to be associated with the World Cup winner, though it appears clear that Los Blancos won't consider his sale in the summer.